The program allows editing hosts file. - The program translated into French (thanks to the Ralfi from Paris - France). - The program translated into Russian (thanks to the Pavel Gulin, Republic of Belarus). - The program translated into Simplified Chinese (thanks to the YanJun Sun). - The program translated into Korean (thanks to the Jaehyung Lee, kolanp@gmail.com). - Add Network Watcher (Help/ Network Watcher). ​ (Additional Tools/ Add HFE-Take Ownership). - Improved certain functions of the program. - Program translated into Dutch (thanks to John K. - Netherland). - Prevent duplicate execute of this the Program. - Improved certain functions of the program (Block Telemetry...). - Show deleted items - View menu - (there is a possibility of restoring deleted items). - Show added or modified items (View/ Show added or modified items). - Show disabled items (View/ Show disabled items). - Added System Information (Help / System Information). - Added System Tray Icon. With your help, this program Hosts File Editor can be translated into other languages. - (Enable / Disable Windows Update). - (Clean Windows Update History...). - (Enable / Disable Windows Firewall). - (Create Rules in Windows Firewall...). - (Enable / Disable Windows Defender...). - (Enable / Disable Hibernate...). - (Enable / Disable Windows Security Center...). - (Enable / Disable UAC). - (Delete System Restore points). - (Block run certain Applications). 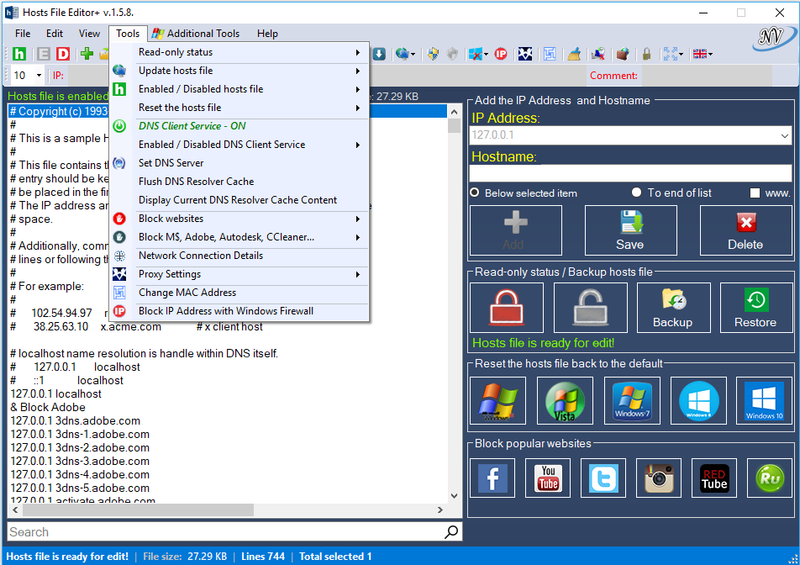 - Set DNS Servers (Tools/ Set DNS Servers). - Set Proxy settings (Tools/ Proxy Setings). 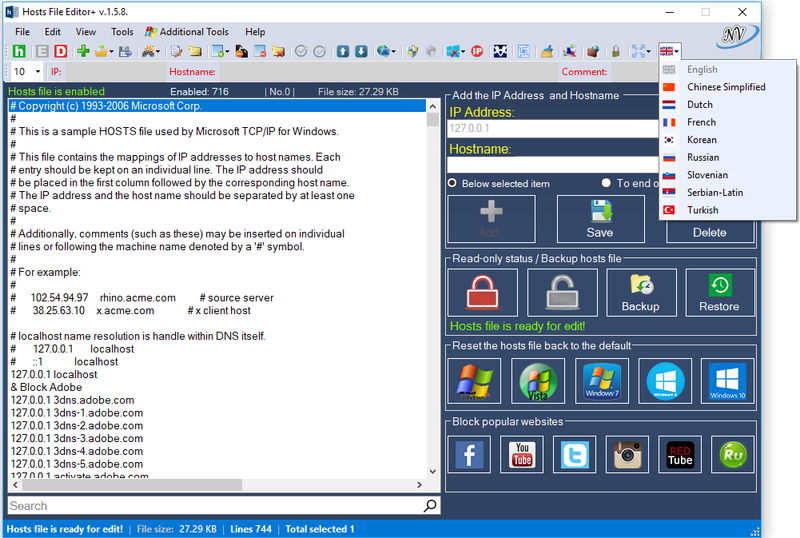 - Added IP Address and Hostname below the selected item. - Added IP Address and Hostname to the end of the list. - Up / Down Selected item. - Added a label to display the total hostnames. - Flushing the DNS cache clears all entries and reloads the entries from the Hosts file..
- View the current DNS resolver cache content and the entries preloaded from the Hosts file. Zoom In and Zoom Out the Program Window. - Sorting the found items (Search). - Added Enable / Disable selected hosts (one or more). 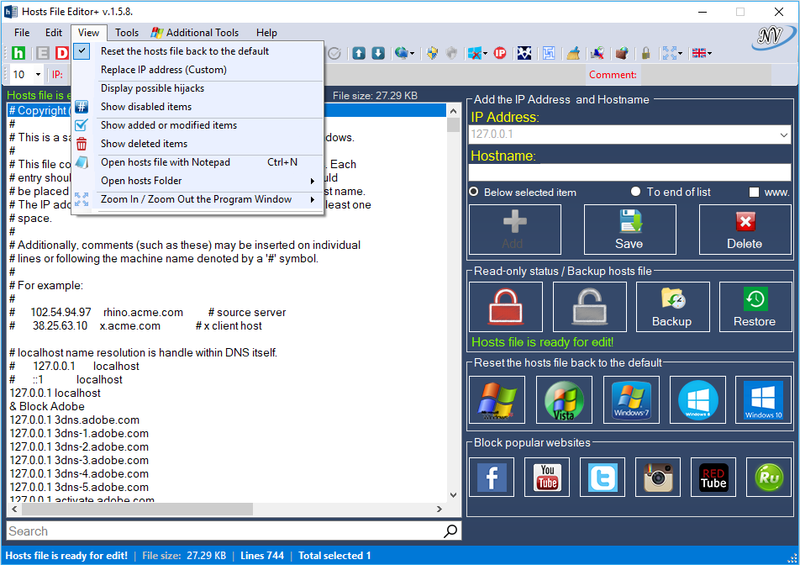 - Added Enable and Disable (hosts file) buttons to the toolbar. - Added certain functions for right click.